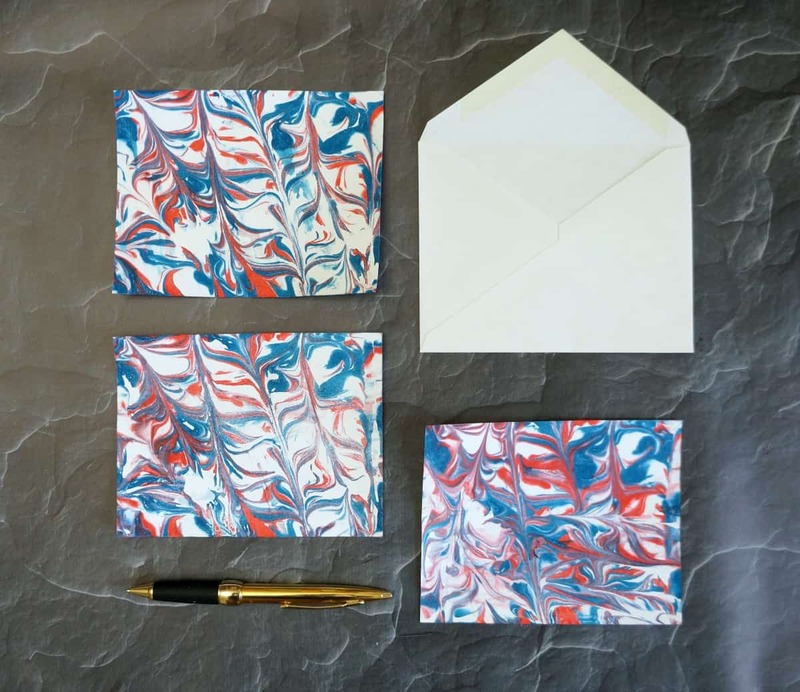 This beautiful set of marbled paper cards makes a great gift, or creative personal stationery. 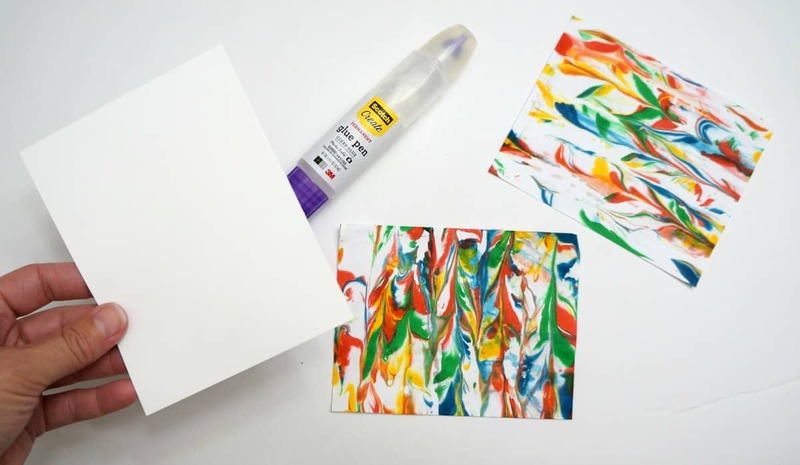 This technique is easy to do with supplies from the Dollar Store and can be replicated on a variety of surfaces. Be sure to watch the video to see how it’s done then read on for more details. 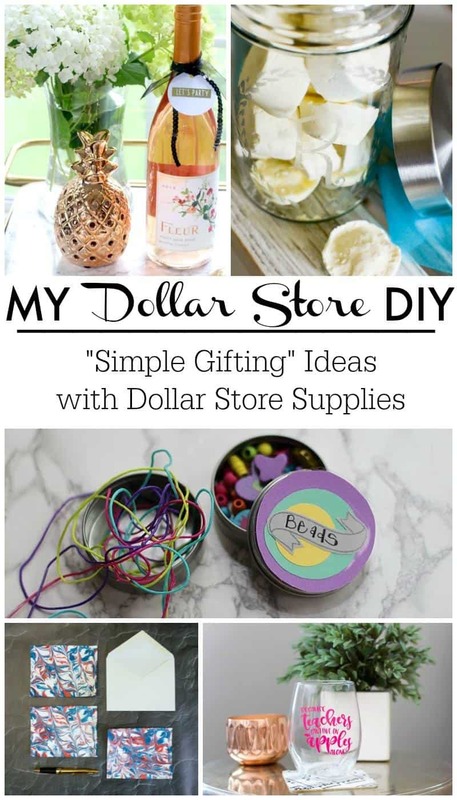 I am also sharing some simple gifts created by fellow bloggers with Dollar Store items, you can find their projects at the end of this post. I am a bit obsessed with marbling, it leaves a beautiful effect on paper, glass, ceramic and even fingernails. This water marbling technique is a favorite of mine. To create marbled paper you need a few supplies. Start by cutting your plain paper and copy paper to size. I cut a single sheet into 4 equal card sized pieces. 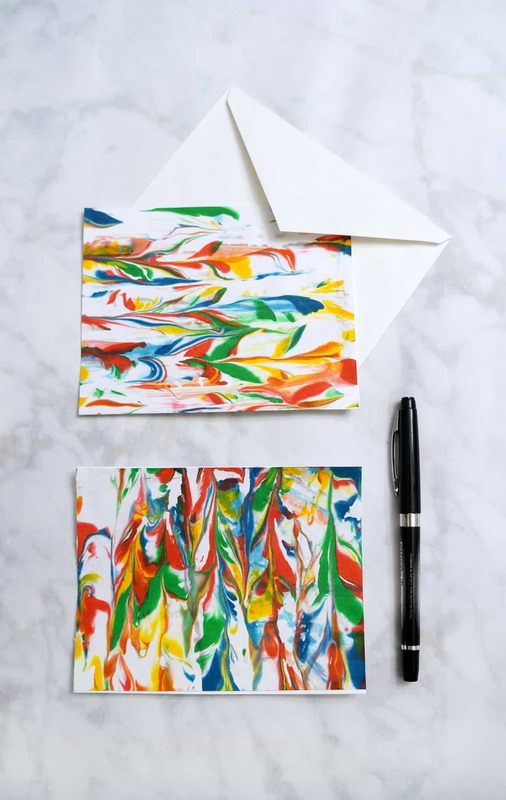 You will apply the marbling to the copy paper and, once dry, attach the cardstock to the back. This provides a smooth and clean writing surface. Fill the glass dish with shaving foam, be sure to choose a dish wider than your paper. Then drop food coloring into the dish leaving polka dots of color. Next, swirl the color around using a wood pick, the design you see in the foam is the design that will transfer to your paper. Place a piece of paper on top of the foam and gently press down. Peel the paper off the foam and scrape off the excess. Set aside until the paper is completely dry. Once dry, attach the cardstock to the back. 4 of these cards and envelopes tied with a simple bow makes a lovely gift. This is something you can make ahead and give to a teacher, friend, or co-worker on the right occasion. Now take a look at these simple gift ideas from my favorite fellow bloggers. These are so pretty!! What a quick and easy gift idea! I love having notecards on hand. Love it!! These are gorgeous and so easy, I would love to sit and make a big batch with my kiddos for gifts! Great idea. That would be fun, the kids could make their own custom gifts. I love the marbling craze! I still have to try it! Love these cards! Beautiful, Sarah! I’d love to try and make one. There are so many uses for this as well! I have never tried marbling, but you make it sound so easy. Have to give it a try!